By Tim Wilson - posted Tuesday, 15 August 2006 Sign Up for free e-mail updates! The debate on the benefits of market liberalisation has shifted enormously in the past 20 years. Gone are the days when anyone seriously argues that free trade brings poverty or that socialism brings equality-based prosperity. The benefits of trade have gained such currency that even rock stars now call for trade as a means to economic prosperity. Sadly, behind their calls for greater trade opportunities lies a campaign that seeks to undermine the system that promotes the material prosperity they seek for people living in developing countries. Despite its claims to promote prosperity, the “Fair Trade” campaign builds a bureaucracy funded by developing country farmers, based on a top-down business model that undermines productivity, quality and opportunity for poor farmers. The “Fair Trade” campaign will undermine the economic prosperity of developing countries. Its flagship is the coffee trade. Coffee is a major international commodity traded globally in a market worth more than US$10 billion a year. It is produced in over 50 countries by up to 25 million farmers and is mostly produced in the developing world. It is also a core export for many developing countries, reaching as much as 50 per cent of total export revenue for some countries. Key producer countries lie in South America, South-East Asia and Africa. Coffee is a highly volatile commodity. Price hikes due to a poor harvest can easily plummet in succeeding years due to bumper crops or increased plantation to take advantage of high prices. This volatility caused the international community in 1962 to attempt to stabilise the market by managing trade through the United Nation’s International Coffee Agreement (ICA). The aim of the Agreement was to try to stabilise coffee production internationally. It achieved this by controlling the market through quotas and by ensuring that countries withheld supply when it peaked above consumer demand, effectively controlling prices. The ICA was used as a development mechanism to assist the Third World; it fell with the collapse of the bipolar architecture of the Cold War. Moving beyond managed trade has had a parlous affect on producers. It has been coupled with marked improvements in coffee production which have resulted in a general fall in the price of production. The introduction of Vietnam as a significant coffee producer has also had a significant impact. Brimming with cheap labour, it has increased its production from 1.4 million bags in 1990 to ten times that number in 2000. Brazil’s increase in efficiency is even starker. Despite being the largest coffee-producing country in the world, with mechanisation of coffee production in the 1990s it managed to double its production from around 25 million bags in the early 1990s to 50 million bags in 2002. This growth was accompanied by depreciation in the Brazilian Real, which reduced the price of coffee on the international market even further. The increase in Brazil’s output was larger than the growth of Vietnam’s alone, and had a significant effect in deflating the price. Added to a fall in price, there has been a reformation of the retail coffee industry, particularly in the United States, where quality coffee had long been a tourist attraction for holidays in Europe. New “Grande” sized coffee retailers such as the US mega-chain, Starbucks, opened the coffee market and broadened consumers’ palates. The effect was greater consumer demand for quality coffee. While retailers such as Starbucks led the pack, it also encouraged the emergence of smaller boutique coffee houses to cater for the coffee “snobs” as Starbucks became more of a fast-food-coffee outlet than a coffee connoisseur’s destination. An emerging market gap was filled by smaller coffee chains and individual retailers who could offer consumers an individualised coffee experience. In 1989, there are estimated to have been 585 coffee houses in the United States, by 1995 it was 5,000, in 2003 it was 17,400 of which 40 per cent are estimated to have been large chains. Despite anti-big business rhetoric that it preys on small business, Starbucks opened the coffee consumer market for small boutique coffee businesses. With quality coffee comes quality prices. The consumer’s experience moved from a $1 bottomless filtered coffee to a Venti Soy-Macchiato with an artificial sweetener at prices up to $5. Anti-globalisation activists expressed outrage as the retail price increased while the price paid to producers sat at market lows. Citing it as evidence that globalisation and the free market system favoured the rich at the expense of the poor, as that gap widened, so did their outrage. The NGO Oxfam International declared the situation as a “Coffee Crisis” in its 2002 report, “Mugged: Poverty in your coffee cup”. It stated that the “crisis” was squeezing producers while the middle-men corporations such as Nestlé and Kraft were awash in cheap products that were then on-sold to retailers who sold the product at premium prices. 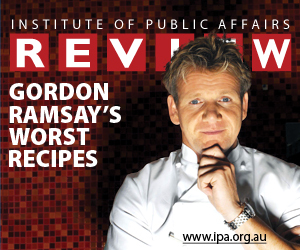 This is an edited extract of an article which appears in the July edition of the IPA Review. An edited version was published in the Australian Financial Review on August 12, 2006. Tim Wilson is the federal Liberal member for Goldstein and a former human rights commissioner.